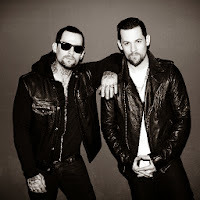 The Madden Brothers are heading to Nashville to write and record music with Florida Georgia Line. "We're such big fans of those guys," FGL's Tyler Hubbard tells Rolling Stone Country of Benji and Joel Madden. "We're going to be writing with them and recording at the Treehouse studio in Nashville. They'll be in town in the next week or two, and we're really excited." Though neither Hubbard nor his bandmate Brian Kelley would divulge any plans, they both assured that the result would be in keeping with their "anything goes" approach. "You'll just have to wait and see," adds Kelley with an eyebrow raise. "We got along with these guys the minute we met," says Joel Madden. "Then ended up having an awesome hang one night in New York City. We're really excited to go to Nashville, hang and write songs. We think it's really cool our paths crossed and that we get to experience Nashville and music with these guys. We are big fans."